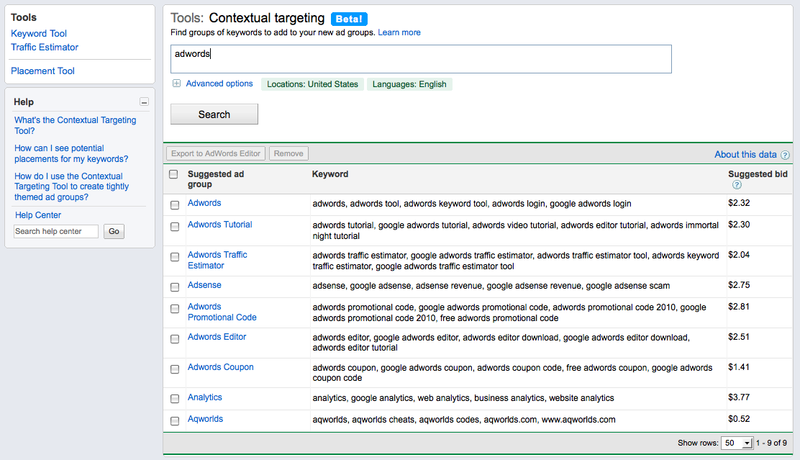 I finally got a Beta invite to Google Adwords Contextual Targeting tool. Although I haven’t yet had a chance to utilize the Contextual Targeting tool to its fullest, I did put it to some quick tests. The Contextual Targeting tool appears to show great promise for several obvious reasons and one not so obvious reason. The tool performs as described for its intended and obvious uses – establishing tightly focused lists of keywords and then grouping them into respective ad groups. What the tool also does in a not so obvious way is winnow down potentially unmanageable long tail keyword lists into lists of mostly head only terms. The resulting lists of keywords and ad groups thus provide great insight into what type of contextual targeting inventory Google has available. Does this tool then not in the process also identify true keyword head inventory? It appears to do so to me. This entry was posted on November 24, 2010 at 2:51 pm and is filed under Google AdWords Contextual Targeting Beta. You can follow any responses to this entry through the RSS 2.0 feed. You can leave a response, or trackback from your own site.